After a busy day of Christmas shopping on Wednesday, Mom and Dad decided to go to Crossroads for dinner. 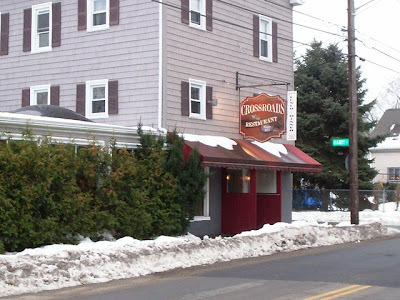 Crossroads is one of my family's favorite places to eat, and everyone that we've recommended this restaurant to has immediately fallen in love with it. Since Dad had ordered something that Mom knew I would have loved, we decided to visit Crossroads today for lunch at around 3:15 p.m. Mom definitely didn't mind visiting this gem twice in one week. When we pulled into the parking lot, we spotted a few cars. Both Mom and I were glad that it didn't seem too busy, as this restaurant tends to fill up very quickly. They even have an extra parking lot across the street for the overflow of cars that usually happens on weekends. Once inside, we were greeted by my mother's favorite sign which reads "please seat yourself." She loves when restaurants allow you to choose where you want to eat your meal. Since Crossroads has three different rooms, we decided to sit in my mother's favorite of the three - what she likes to call the "Florida" room. Actually, we usually reference the TV show Golden Girls when sitting in this room. It resembles their back patio, or what they called the "lanai." As we walked into the room, we were followed by a hostess in a black uniform. She placed two plastic-covered menus on the table and told us that our waitress would be right over. I asked her if Crossroads offered a takeout menu (as I like to take them home to relay the meals and prices to our fans), but she said that they did not. However, she did say that their full menu is available for takeout - everything except the soup (as they don't have the containers for it). While looking over the menu, which had a list of luncheon specials inside, we were greeted by our waitress. Her name was Becky T., and she quickly took our drink order. Both Mom and I ordered two Diet Pepsis (which came with lemons), and they arrived in real glasses. We needed another minute to decide what we wanted, so Becky retreated to the kitchen while Mom and I slowly made our choice. There are so many options at Crossroads, but I knew what I was there for - the spicy baked haddock. This is the meal that my mother had told me about. When my father had ordered it, she said that it looked amazing. I couldn't wait to see, and taste, it for myself. When Mom and I had finally made our decision, Becky came back to the table to take our order. 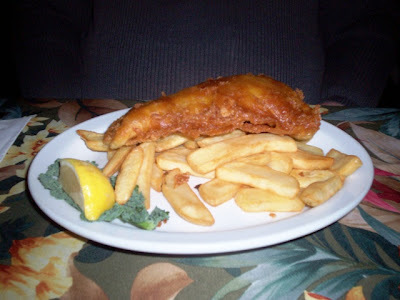 Mom ordered the fish and chips ($13.95). Her dish came with soup or salad, and she chose a salad with French. I ordered the spicy baked haddock ($14.95), which came with a potato, pasta, or vegetable option. I chose fries, and I also got to choose a soup or a salad. When I asked what the soup options were, I was very surprised - and pleased - to hear that they offered French onion. This is almost never offered as one of the complimentary soups. I decided to go with the onion soup, and Becky graciously took our menus away. She even brought me a spoon so that I could retrieve a lemon seed that had slid into my soda. What a gal! Open since 1977, Crossroads is a beautiful restaurant. The first room you hit when you walk in is their bar area. It is a beautiful wooden bar which also has a few tables behind a small partition so that patrons can dine while they drink. Mom and I call this the "trendy" room, as it resembles a night club hot spot. The second room is the "Florida" room. My entire family always sits in this room, and it's fantastic. There are faux plants everywhere, and a huge faux tree display covered with lights on one of the back walls. With only wooden tables and chairs, this room seems to cater to a family and an older crowd. 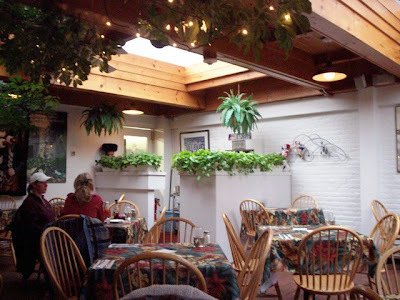 There are bright floral tablecloths, beautiful skylights framed by light wood, and large sliding windows that face the street and the foliage outside. The white painted brick really keeps this room bright, while the various pictures, posters, and Christmas decorations give this room an friendly appearance. Christmas music played in the background while Mom was falling in love with one of the holiday decorations - a lighted stack of Christmas gifts. It really was cute, and I thought she was going to try and walk off with it! With our chosen table being directly under the large, lighted trees, we were able to see into the third room. Mom likes to call this the "pub," partly because it resembles an Irish pub. This room is usually reserved for parties, and today was no different. 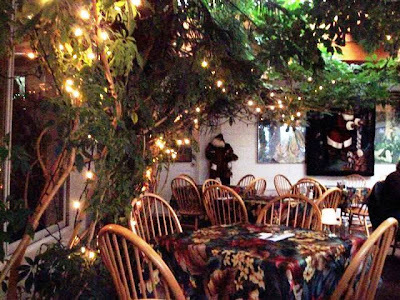 There was a velvet rope blocking anyone from entering, and I often saw waitresses darting in and out of there with handfuls of dinnerware. Becky reappeared with my soup and Mom's salad. My onion soup was baked and topped with a thick layer of cheese. It was very hot, and extremely tasty. I have had the onion soup here once before and found it to be delicious. I was definitely not let down this time around. Mom's salad was very good. She said the veggies were fresh and crunchy, and the cup of French dressing was very tangy and refreshing. Also with our soup and salad, Becky brought over two Italian rolls, which were crunchy on the outside and soft on the inside. They were so good. 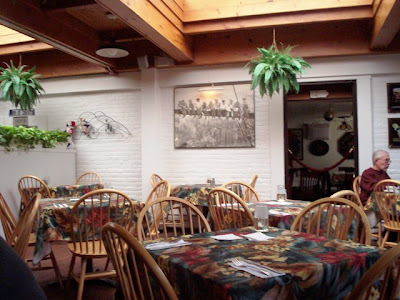 You can spend quite a while trying to decide what to order at Crossroads, but there is virtually nothing about this restaurant on the Internet. Because of this, I've decided to list as much of the menu as I can. All food is fresh and prepared to order, which is a welcome change from some of the chain restaurants that simply just heat up a waiting dish of food. Appetizers include little necks ($8.95), buffalo chicken tenders ($8.95), crunchy chicken tenders ($8.95), Southwest egg rolls ($8.95), mushroom caps ($7.95), potato skins stuffed ($8.50), Maryland crab cakes ($9.95), fried calamari with hot pepper rings ($8.50), fried calamari in garlic and oil ($8.95), onion rings (small - $3.95; large - $4.95), grilled cheese sticks ($7.95), buffalo chicken wings ($7.95), Southern fried wings ($7.95), Pub fries (small - $1.95; large $2.95; with cheese - add $1.50), and a stuffed quahog ($3.95). Salads include a variety of Caesar salads with grilled chicken ($10.95), sirloin steak ($12.95), or grilled shrimp ($12.95). Julienne salads ($10.95) are created by choosing any combination of three meats and cheeses, including turkey, ham, roast beef, and Swiss, American, and Munster cheeses. Buffalo chicken salad with crumbled blue cheese is $11.95, while the spinach salads range from $4.95-12.95. Garden salads range from $2.95-10.95, depending on size and added meats and cheeses. If you’re looking for something light, all regular and specialty sandwiches are served with your choice of pub fries, potato salad, or cole slaw. Sandwiches include the Crossroad burger ($8.95), fresh grilled chicken breast (plain or Cajun - $8.95), Pub clubs ($8.95), chicken parmigiana, meatball sandwich parmigiana ($8.95), grilled chicken croissant ($9.95), Delmonico steak deluxe ($10.95), surf and turf sandwich ($13.95), which includes half lobster salad and half Delmonico steak with two toppings, New York style Reuben or Rachel ($8.95), tuna melt ($8.95), hot turkey melt ($9.95), veal parmigiana ($10.95), chicken salad ($8.95), tuna salad ($8.50), lobster salad ($15.95), vegetarian burger ($8.95), and a vegetarian pocket ($8.95). For something with a little more substance, all entrees include your choice of fresh garden salad or cup of homemade soup, and a choice of potato, pasta, rice pilaf, or house vegetable with hot baked rolls and butter. Chicken dishes include a Caesar Salad topped with fresh grilled chicken breast ($10.95), chicken Marsala ($13.95), chicken parmigiana ($13.95), chicken Manhattan ($14.95), chicken and broccoli saute ($14.95), and chicken picatta ($14.95). Seafood and pasta dishes include linguine with red clam sauce ($11.95), linguine with white clam sauce ($11.95), baked haddock ($13.95), little necks zuppa ($14.95), little necks Sicilian ($15.95), fried clams (market price), baked or fried sea scallops ($17.95), fresh fried oysters ($15.95), fried clams & scallops (market price), scallops in a white wine sauce over linguine ($17.95), fresh grilled salmon ($16.95), fresh grilled swordfish in lemon and butter or Cajun (market price), and four shrimp scampi ($16.95). Meat dishes include the Yankee pot roast ($13.95), meatloaf ($12.95), baby back ribs (1/2 rack - $13.95; full rack - $17.95), 12 oz. prime sirloin steak ($14.95), prime sirloin steak a la Mama ($15.95), Filet Mignon (market price), and the surf and turf combo which includes a prime sirloin steak served with your choice of two stuffed jumbo shrimp ($16.95), fried scallops ($17.95), fried clams (market price), fried haddock ($15.95), and fried oysters ($15.95). Luncheon specials are served until 5 p.m., and there is a list of specials inside every menu. Choices for the price of $8.95 include the open face turkey and steak sandwiches. Choices for the price of $9.95 include chicken parmigiana, meatballs and ziti, and homemade meatloaf. 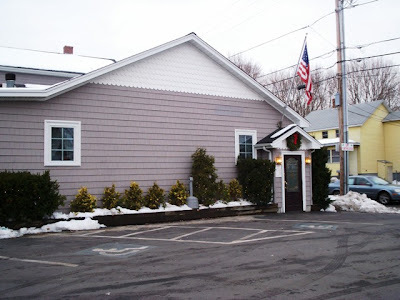 These meals come with your choice of New England quahog chowder, soup of the day, or fresh garden salad. Choices for the price of $10.95 include chicken Manhattan, steak a la Mama, scallops, chicken Marsala, and Yankee pot roast. These meals are served with a garden salad, and hot baked rolls with butter. Also for $10.95, you can choose to get a cup of New England quahog chowder, French onion soup, or the soup of the day with a luncheon side of fish and chips, fried oysters, clams, scallops, or prime sirloin steak. All luncheon sides are served with Pub fries. For the best of both worlds, you can order a soup and half sandwich. Sandwich choices include the solid white tuna or chunk white chicken salad ($8.50), Reuben or Rachel ($8.95), steak ($8.95), and 100% Lobster salad ($10.95). All sandwiches are served with pub friends. There is also a large selection of wine, beer, and non-alcoholic beverages. It didn't take long for our food to arrive. Becky brought over the two meals, and everything looked and smelled amazing. She offered to bring us ketchup and vinegar for our fries, and I accepted the offer. She returned briefly to give us the condiments, and then left us to dig into our entrees. Both Mom's fish and the chips were terrific. The fries were obviously hand cut, and were of the steak fry variety. They were very potatoey and delicious. The fish itself was a large piece of snow white haddock and it was fried just right. It had a light, thin crust on it that was crispy and not at all greasy. It was the lunch portion of fish, and thank God she got that size because it was really big enough. She enjoyed it very much. It was a great dish. My spicy baked haddock was everything that Mom described, plus more. 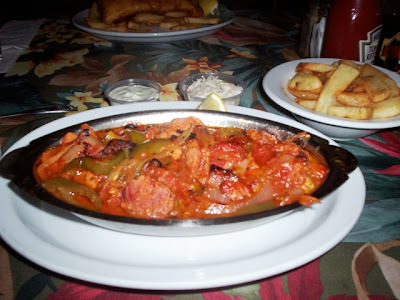 Topped with a layer of peppers, onions, and chourico, the haddock never lost its flavor. If anything, the peppers, onions, and chourico only enhanced the taste of the delicious fish, and the haddock never got squashed under the weight of everything else. The chourico was very meaty, and the vegetables were very fresh. The sauce that everything was baked in was very spicy, but not overwhelming. The only thing that was overwhelming was the heat, as it was served in a metal serving dish. This, however, is not a bad thing. Like Mom, I can't stand when food is not served hot. Even my fries were delicious. The thick steak fries were hearty and tasty. *This is the price for the lunch portion. We left $40 on the table for Becky, including 20% tip for her excellent service. Although we did not use the restroom on this visit, Mom has on previous occasions, and she found it to be very clean and nicely decorated. Feeling very warm and satisfied, Mom and I walked back to the car and vowed to return to Crossroads as soon as we can. With Christmas almost here, a gift certificate to Crossroads would be a great gift for just about anyone. I bought one for my parents a few years ago, and they raved about their meals for days. Crossroads is definitely staying put on our "excellent" list. Crossroads is closed on Monday, but open from 11 a.m. to 11 p.m. Tuesday through Saturday, and 11 a.m. to 10 p.m. on Sunday. Lunch is served daily until 5 p.m.